So you bought, or plan to get, an Apple Watch. 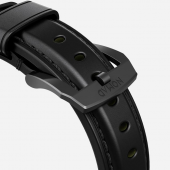 It will ship with a band, but it will likely be little more than functional. They are nothing to get excited over. 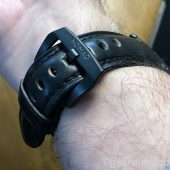 The good news is that Nomad offers some impressive watch bands that take things upon a notch. 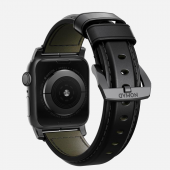 Among them is the beautiful Nomad Shell Cordovan Strap for Apple Watch. Let’s get this out of the way up front. 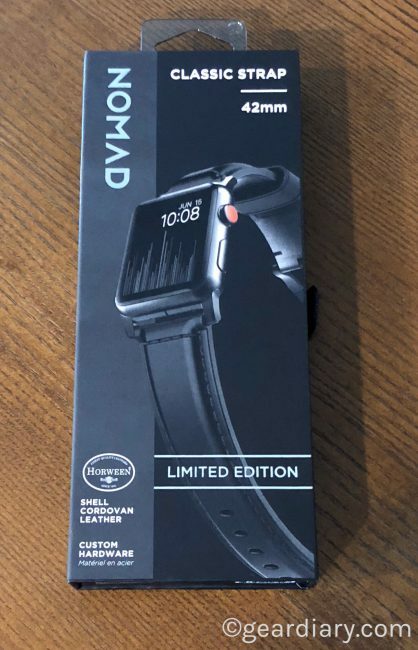 The Nomad Shell Cordovan Strap for Apple Watch has an MSRP of $149.95 and is currently on backorder. That means it is pricey as hell, and you won’t even be able to enjoy the instant gratification we have all come to expect. 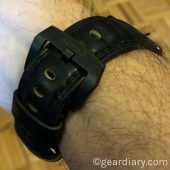 Still, if you can get past the initial sticker shock of the strap and can wait to receive yours and look more deeply into it, you will find that this is much more than just a strap. This is a piece of leather artwork that you will be proud to wear day in and day out. 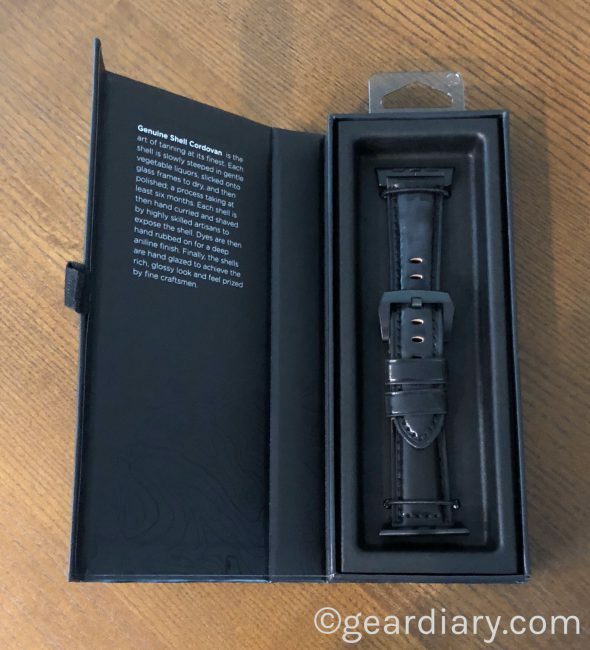 I received the 42mm version of the Nomad Shell Cordovan Strap for Apple Watch. Designed to be unique, the Nomad Shell Cordovan limited edition strap gives your Apple Watch a classic, yet bold, new look. Made with Horween Leather’s legendary Shell Cordovan, the finish is hand-glazed, creating a rich and glossy look. The inside of each band is uniquely patterned. The leather – taken through a specialized six month process from tanning to polishing – is designed to beautifully patina with time, creating a handsome, rich leather strap with a look that is uniquely yours. The strap itself is made from Shell Cordovan Horween leather finished with Fil Au Chinois beeswax linen thread. We’ve seen Nomad employ Horween leather in other products, but it shines here. 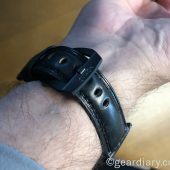 The raw finish of Shell Cordovan on the inside of the band creates a nice contrast to the exposed black surface and, according to the company, “produces a variety of dark greens intermixed.” (I’m color diffident so this lovely subtle aspect of the watch band is entirely lost on me.) At the final step in the band’s construction, the leather is stamped to indicate that the leather comes from Horween’s tannery. The band is thick, rich in color and feels substantial on your wrist. Better still, as it wears, the leather gets better over time. Horween Leather’s Shell Cordovan is hand crafted by skilled artisans throughout a six month tanning process. 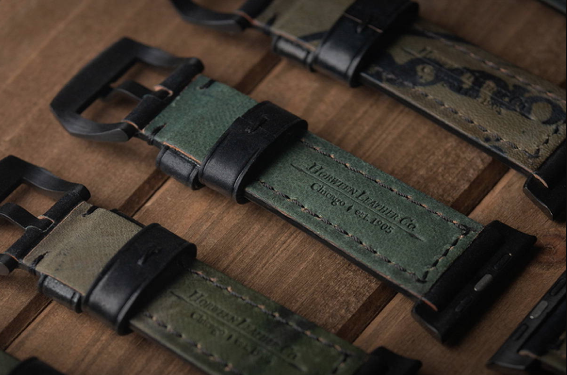 As the strap comes into contact with the elements around you, the leather will develop a rich patina, or a dark lustrous sheen, making your strap unlike any other. 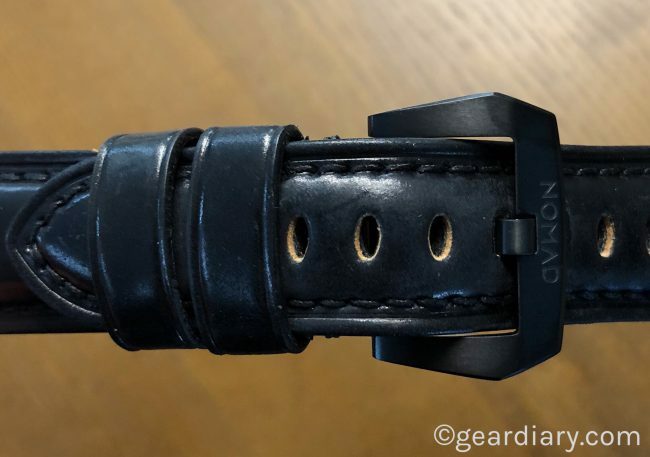 The Nomad Shell Cordovan Strap for Apple Watch review sample I received works with both 42mm and 44mm Apple Watches. 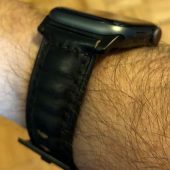 The Nomad Shell Cordovan Strap for Apple Watch is gorgeous. There’s a reason it is described as a “Limited Edition” and is currently on backorder. The leather is beautifully tanned, and the finish is as refined as we have come to expect from Nomad. 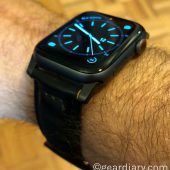 I love this band but did find it to be far too stiff when initially installed on my phone. It didn’t sit properly on my left wrist. 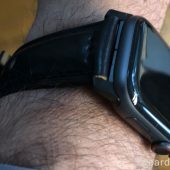 It was even more problematic on my right wrist since that wrist is thinner than the left ever since it was surgically fused. It was a problem and, for some time after receiving the review sample, I didn’t wear it. Every few days, however, I spent a few minutes bending, twisting and otherwise beating up on the band. Each time I did, the leather became a bit softer. It eventually became soft enough for me to start wearing. 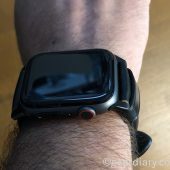 And while the band is still not quite as soft as I would like, I do love the way it looks, adding a level of class to my Apple Watch Series 4 that makes it appropriate for wearing at even the most formal of events. 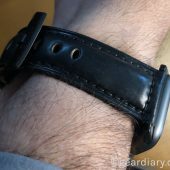 If you have an Apple Watch and want to add some custom refinement to it, you should check out the Nomad Shell Cordovan Strap for Apple Watch. 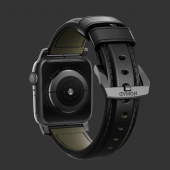 It is a beautiful leather strap. And while it might take you some time to soften the leather enough for comfortable use, I can vouch for the fact that it is worth the effort. 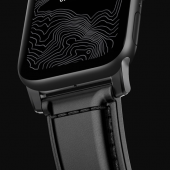 Check it, and Nomad’s other Apple Watch bands, out here.